Whenever I talk about negative thinking I need a good bath to wash it off. But you also never want to get stuck in it. As I talk about in the track below, like cleaning out a wound it’s necessary to clear out limited thinking, yet limitless thinking is better and better. Why amazing thinking isn’t the default in our brains and world is beyond us, yet we can choose. For some people it’s easy to choose amazing, but for many of us it can take training. 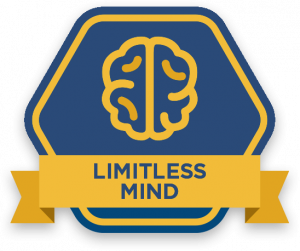 Once you get it thinking more limitless, it keeps driving more this way. It’s a nice-sounding quote, but 100+ years later, how many of us are trained to actually live this way? How you actually live it. It’s not about knowing you can alter your attitude. Like getting in the best shape of your life at the gym, you want a training program to deeply condition yourself this way. I see happiness is a false goal. Only the unhappy talk about happiness, and to me feeling amazing is merely a vehicle for living your most amazing life today. Not in the future. Not when something changes. Changing your thinking for living most amazing now. Thinking and feeling amazing we’re truly alive today. Thinking and feeling amazing we’re dreaming up our grandest futures. And thinking and feeling amazing, we’re absorbed in our best actions bringing them to life. I only ever cared about feeling amazing at will for taking my best actions “creating” my most amazing life. The grander prize I discovered is you can feel amazing creating your most amazing life right now. I never minimize these things, this still takes work for me, but it’s the greatest work of our lives. Yet, drink a few beers or pop a pill and nothing in your life needs to change for you to be feeling “better” right now. Nobody teaches us we can train our minds to do the same. “Normal” might be limited thinking, but in my dream we all think limitless. Limitless energy. Limitless focus. Limited motivation. Limitless feeling amazing. Limitless imagination, for limitless scheming and dreaming. Can you imagine how much more limitless you can be right now? Could you imagine what would be possible for humanity? I can. It’s my dream. And I wake every day to develop and share the best tools I know.